Virginia Court Hotel01263 512398work RestaurantIn our restaurant and dining room we are proud to offer ‘A Taste of Norfolk', with local farm produce in both the breakfast and dining menus. Start the day with an award-winning hearty breakfast of either fresh whole kippers smoked locally in Cromer, a full English with sausage and bacon from a farm less than 5 miles away, or for a lighter option try our delicious breakfast pancakes. 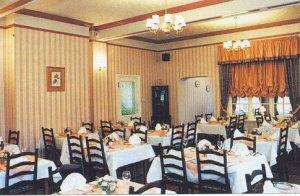 The restaurant serves evening meals from 1830, and is open to residents and non residents. Our chef has an enviable local reputation, and creates classic English dishes. We make everything from raw ingredients, building a menu each day according to what's in season and available locally. This changes on a regular basis, but always includes crabs caught on our doorstep (when available), 35 day aged sirloin steaks from Groveland Farm (just five miles away) and delicious desserts.